At Universal Kitchen Center, your cabinets come with peace of mind because we stand behind them 100%. Your kitchen cabinet investment comes with a limited Lifetime Warranty for as long as you own your home. 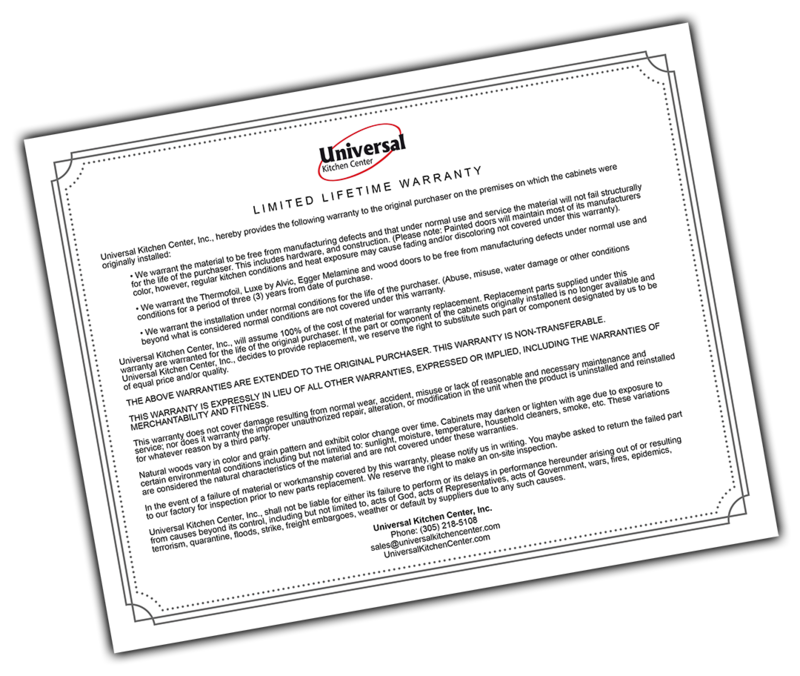 Ask us for a copy of our limited Lifetime Warranty when you book your Free Consultation. Call us today at (305) 218-5108 to schedule an appointment for a Free Consultation, or click the button below to schedule it online. There's no cost or obligation so you have nothing to lose because if we can't help you, I will let you know right away and recommend other options. It's that simple! “Love my beautiful kitchen and bathroom cabinets and the great customer service you provided. "I am in love with my kitchen! It was a smooth and pleasant construction process. Enrique was very professional and gave us a bunch of different ideas. Highly recommended." "I love my New kitchen it is Beautiful!!! Enrique and all the staff of his company are very friendly and professional, they give all their help at all times during the process!!! They also made the cabinets of my three bathrooms and everything looks spectacular!!! Thank you Enrique and Abel for all the work!! I recommend them!" fashion without written permission from Universal Kitchen Center, Inc.